One of the most unique photo opportunities in Vancouver this season does not involve light displays or a jolly old elf in a red and white suit. The Kettle Society, Harbour Centre, and the Vancouver Lookout are inviting locals and visitors the chance to get Snow Globed for a cause. Visitors to Harbour Centre’s lobby can have a photo taken inside a giant snow globe with their own camera or phone for a minimum donation of $5. Full proceeds go to The Kettle Society, a local non-profit that assists people living with mental illness. The Kettle Society supports people living with mental illness to lead healthier lives by: Providing Housing, employment, advocacy and support services; Raising awareness of mental health issues and breaking down barriers; Promoting the inclusion of people living with mental illness in all aspects of society. The Kettle Society provides over 3,600 individuals with 26 services, a mental health drop-in, a transition house for women and over 200 units of supported housing. It is committed to practical and non-judgemental harm reduction strategies in all its work, as it has been for over 35 years. The Harbour Centre lobby is located at 555 West Hastings, Vancouver. Stop by between 10:00am and 2:00pm, Monday to Friday through December 20th to get Snow Globed. This will also be open for photos on Saturday, December 6th. While you’re at Harbour Centre, take the elevator up to the Vancouver Lookout for some awesome 360 degree views of the city and the snow-sparkled North Shore mountains. 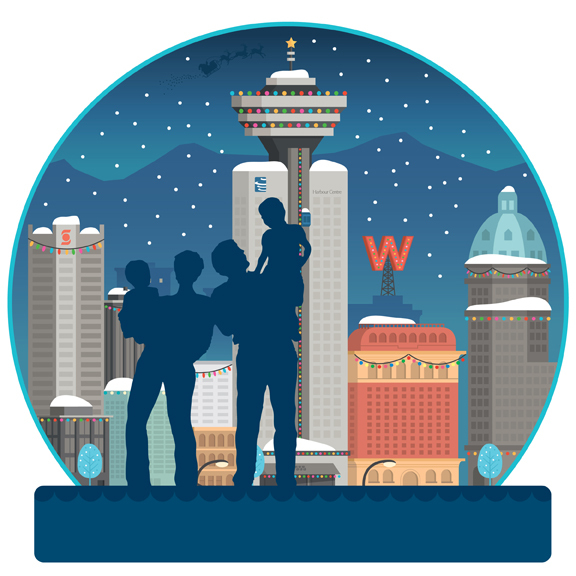 Tag your snow globe photos online with #SnowGlobedatHC and follow @harbour_centre and @VanLookout for more information.